As we have seen in Africa, when children become fighters at an early age, they provide a pool of men who for at least a generation cannot do anything but fight. It is difficult to "de-program" them into peaceful citizens. In turn, this leads to what we might call "supply-side war," war driven largely by the presence of men who want to fight. This kind of half-war, half-brigandage swarmed over Europe during the interval between the end of the Middle Ages and the rise of the state. After Westphalia, the state put an end to it by rounding up the brigands and hanging them. In Iraq, where the fictional state cannot even round up kilowatts, supply-side war suggests that disorder will be rampant, and a state non-existent, for quite some time. Iraqi security forces in Karbala, unable to control violence between the Badr brigades and the Madhi army, ordered one million pilgrims to leave the city. If you thought a Sunni/Shiite civil war was the end game or a grand coalition that enforces a soft partition is the answer, think again. NOTE: As I point out in Brave New War: in a post-state global system, newly emergent loyalties (to groups other than the state) don't cling to simple formulas of religion or ethnicity. Instead, it's a race to the bottom to find the most successful unit that meets the needs of the participants. Richard Feynman's famous quip, "there is plenty of room at the bottom," is in reference to the potential of nanotechnology. The same could be said about is the size of a group that represents an autonomous unit -- in that it can defend its interests -- in the globalized environment. We haven't found the bottom yet. Here's an example (that ties into the fires in Greece below): a story in the NYTimes, August 28, by William Yardley called, "Wealthy Get Extra Shield for Wildfires." Security has always been a function of money and location, but we could always assume a base level of security from the government. That appears to be evaporating (as with Katrina, where private military contractors were flown in to protect the homes of the wealthy). As a result, security is now being built into the global systems that support the wealthy that jet between lily pads -- with a new emphasis on protection from black swans (unexpected disasters). As this matures, the market for security services will soon match (and likely exceed) the rapidly widening spectrum of care we currently see in health services. Granted, it's the free market at work, but this system locks in critical but scarce services for those that can pay a premium in advance. The antidote for the rest of us? A resilient community -- collective self help. 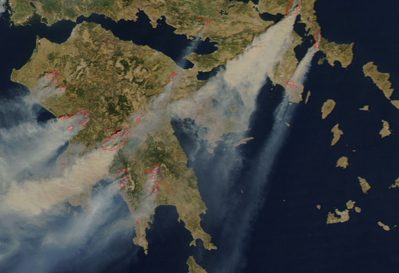 Greece may be under assault, with fires burning in over half of the country. The vast majority of blazes were likely set deliberately (the Prime Minister is already claiming this), given the geographical breadth and the number of new events. For example, over a 24 hour period 200 new fires were started across the country. The timing of these attacks could not have been worse (or selected with more care): a heatwave, a dry winter, strong winds, and lots of fuel have combined to make these fires deadly. What is even more troubling, according to my Greek sources, is that most of the fires have been set around the country's biggest electricity plants. So the potential for a cascading cycle of damage, where the fires knock out electricity production which in turn hampers relief is in the offing. If this is true, on the cheap systems disruption on a strategic scale may have made it's debut in a modern country. The ROIs on this attack are going to be amazing and it looks like the loss in legitimacy the current government is suffering will decide the upcoming election. Counterinsurgency goes mainstream. Here's the link to the interview. He does a great job. It was also effective in that it drove sales of the Counterinsurgency Field Manual to the top 100 on Amazon. NOTE: Wow, the Petraeus information operations media machine is amazing (and this is a great example). Nod of respect to the masterful way in which the Petraeus team has been able to influence the public's perception of this war -- the essence of which was a shift towards marketing the military leadership in Iraq as both competent and brilliant. My short format infographic -- on how open source networks of criminals and hackers can be slaved to state-vs-state conflict -- is in the most recent edition of Wired magazine. Here's a low rez version of the graphic ("When Bots Attack") on their site. In this case China's 300,000 strong hacker networks are utilized. Simple definition: The globally interconnected network of physical systems that underlie and enable modern life. In addition to man made systems, Stewart Brand suggested that I add biological systems to this term. Not a bad idea. Extensions, revisions, alternatives? Please note them below in the comments. JOURNAL: No focus on potential Black Swans? The torrential spread of a new pig virus in China is made more dangerous due to a lack of information we currently have on the epidemic. This is yet another demonstration of the misalignment between our expensive national security system and our needs (as its customer$). Of course, for those of us that understand that the likelihood that the government's cavalry will arrive to save the day is nearing zero (in response to the full spectrum of threats), this will come as no surprise. City Journal posted my article entitled,"The Coming Urban Terror." For the first time in history, announced researchers this May, a majority of the world’s population is living in urban environments. Cities—efficient hubs connecting international flows of people, energy, communications, and capital—are thriving in our global economy as never before. However, the same factors that make cities hubs of globalization also make them vulnerable to small-group terror and violence. Our choice is simple: we can rely exclusively on our current security systems to stop the threats—and suffer the consequences when they don’t—or we can take measures to mitigate the impact of these threats by exerting local control over essential services. Google maps has an interesting new open source job called the "Google Business Referral Representative." If we replace a war against Iraqis Sunnis with a war against the Shiites, we will not only have suffered a serious, self-inflicted operational defeat, we will endanger our whole position in Iraq, since our supply lines mostly run through Shiite country. I say such a defeat would be self-inflicted because Shiite attacks on Americans in Baghdad seem to be responses to American actions. In dealing with the Shiites, we appear to be doing what spurred the growth of the Sunni insurgency, i.e., raids, air strikes and a "kill or capture" policy directed against local Shiite leaders. Not only does this lead to retaliation, it also fractures Muqtada al-Sadr's Mahdi Army as he tries to avoid fighting us. Such fracturing works against, not for, the potential re-creation of an Iraqi state. The majority of the world's population now lives in urban environments. In fact, you could argue that the vast majority of the world's flows (from financial to communication to people) occur within and between increasingly denationalized urban geographies (between the islands of a global urban archipelago) and the defense (via strategies that enhance resilience) of those flows is the key to our our long term victory. If so, why is our counter-insurgency/terrorism strategy still mired in rural or nationalistic archetypes? "Fear of ‘failed cities’ thus seems to be even more powerful than fear of ‘failed states.’"
The global mixing in today’s world renders any simple dualism between North and South, or Developed and Developing, very unhelpful. Instead, it’s more useful to think of transnational architectures of control, wealth and power, as passing through and inhabiting all of these zones but in a wide variety of ways. Extreme poverty exists in many ‘developed cities’ while enclaves of supermodern and high-tech wealth pepper the cities on South East, Southern and Eastern Asia. ...at least until recently – nation states have clearly worked to construct and maintain their monopolies on political violence in a way that rendered cities as mere targets. This reached its apogee within the Cold War imaginaries of full scale nuclear Armageddon. "Many dreams of robotised and automated high-tech warfare, permanently projecting perfect power into global south cities, are emerging here [in the US]. The objective being to try and delegate the decision to kill to computer software embedded within networked weapons and sensors which permanently loiter within or above urban space automatically dispatching those deemed 'enemy'." "As with so much of urban life, the key now is seamless merging of systems of electronic tracking, tagging, surveillance and targeting into the architectonic and geographical structures of cities and systems of cities. The production of space within the ‘war on terror’ thus mobilises an intensified deployment of these sensors and systems – through global biometric passports, global port management systems, glocal e-commerce systems, global airline profiling systems and global navigation and targeting systems – within and through the securitising fabric of urban places." 15 of the 17 high voltage lines running into Baghdad are inoperative due to sabotage. "When we fix a line, the insurgents attack it the next day"
Insufficient production. The grid is only meeting only half of demand. Local disaster. Baghdad power is less than two hours a day. Karbala has been without power for three days. Water production is being severely impacted (pumping and filtration) -- drought. All signs are that global guerrilla infrastructure disruption is in the process completely hollowing out the Iraqi state. With this underlying situation in place, the chances of any meaningful improvement (as opposed to symptom abatement) is nearing absolute zero. Further, even the most minor destabilizing events will run non-linear with amplifying factors like this in place. It's important to note that the indication this current crises was recognized back in 2004 (see Iraq: Electricity Disruption, June 2004 for more). So was the shift in warfare (to open source organization and systems disruption). Unfortunately, to this day, the US military continues to focus on body-counts to measure success or failure (number of al Qaeda dead, number of bodies found dead in Baghdad, etc.) rather than systemic factors -- which is akin to a focus on noise rather than signal. Question: can a similar drive to disrupt global energy system (see "Al Qaeda's Black Swans," February 2006 for more) create a similar level of hoarding and resource competition in the developed world? In Iraq, the long term trend towards the privatization of warfare has finally reached the dregs of this war's long tail: Sunni tribal militias are quickly being formed, blessed with US military "contractor" status, and awarded with a set of golden handcuffs. For those of you that were paying close attention, this shouldn't come as a surprise. It was the inevitable result of the Iraqi military's inability to reduce the influence of primary loyalties (a loyalty to anything but the state) in its ranks and of the US (or any other modern state) to do anything but play with warfare at the margins. Legitimacy and loyalty. Unlike the uniformed Iraqi forces, militias draw on tribal, ethnic, and religious loyalties. Close knit units can be formed on the basis on long-standing relationships. This increases their ability to fight. Rapid ramp-up. These militias require little formal training. They can quickly leverage existing relationships and lines of loyalty to build units. Effectiveness. Decentralized militias have a record of effectiveness. They innovate rapidly and can draw on the same sources of strength available to global guerrillas. They also can take measures the uniformed militaries aren't allowed to. Loss of legitimacy for the Iraqi state. The establishment of every new "contractor" will be at the expense of the Iraqi state's (or any state's) primary claim to legitimacy: a monopoly of force. A new "supercharged" criminal strata. Expect these contractors to quickly expand their operations into criminal enterprise to increase their profits. This will be made all the worse because these units will be able to use the US as enforcers. Last spring, I travelled to Monterrey Mexico to speak to the city's (and therefore Mexico's) top business leaders. Of course, my talk's focus was on how the rise of global guerrillas -- enabled by open source warfare, systems disruption, and transnational criminal networks -- and how this rise would eventually reach Monterrey. I'm not sure they believed me, although they were much too polite and refined to say so directly. I don't blame them for thinking that, since for nearly a decade Monterrey was on the rise, a hub for global business with solid growth and a low crime rate. So, the scenario I presented must have seemed remote at the time. How different a year makes. As Manuel Roig-Franzia writes for the Washinton Post, the Mexican state's war against global guerrillas is now bleeding into Monterrey.